The display was interactive. As participants came by, they had the opportunity to crank the crankie or manipulate shadow puppets. Participants were standing right there in front of the table. The smaller box which held an 11" high scroll, worked well in this situation. Photo by Ruby Carlson. Another fantastic conference by the International Panorama Council. I took two crankie scrolls to display. One was inspired by magic lantern shows. The other one was of a barn quilt trail. This new box, although smaller than the one I took in 2013, worked well in this situation. The box folded up and fit in the overhead bin of the plane. I put the scrolls in a backpack and carried those on board with me as well. That way, if the airline lost my checked bag, I was still in business! The scrolls are made from white Tyvek with black Tyvek images and tissue paper glued to the white scroll. 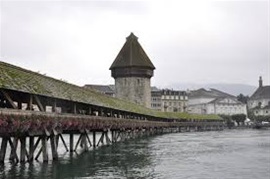 The International Panorama Council (IPC) conference in Lucerne, Switzerland, Nov. 22nd – 25th, 2013 was utterly fabulous. The conference was extremely well planned and coordinated and Lucerne was about the most beautiful city I have seen – a treasure. This was the first time I had attended this conference. Ernst Storm, President of the IPC and Patrick Deicher, Secretary-General of the IPC, set a supportive and welcoming tone for participants which made it easy to talk to presenters and share information. In addition, I had the pleasure of meeting moving panorama experts I have been reading about for some time: Ralph Hyde from London, author of Panoramania! ; Mimi Colligan from Australia, author of Canvas Documentaries; artist and visionary Sara Velas from the Velaslavasay Panorama in Los Angeles, CA and independent researcher Suzanne Wray from New York City among others. The London to Hong Kong moving panorama. This photo is from the Museum of London where it was housed. It was auctioned in December of 2018. Not sure where it is now! One of the highlights was David Brill’s presentation of the moving panorama London to Hong Kong in Two Hours. It was painted by his great, great grandfather John Lab Primus (1799-1875) and great grandfather John Lamb Secundus (1839-1909). The 12” high by 173 foot long canvas is housed in the Museum of London. It has recently been photographed and digitally stitched together so that it could be shown using a laptop, projecting the images onto a screen. In addition, David Brill had the narrative written by the artists. He was able to scroll through the panorama while reading the narrative. David has since graciously shared pictures and information with me about his family’s treasure. Click here to see the page. 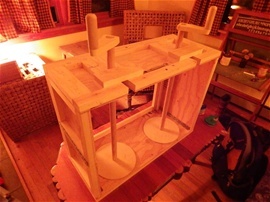 Here is the crankie box folded up, ready to put in a bag for the overhead bin. 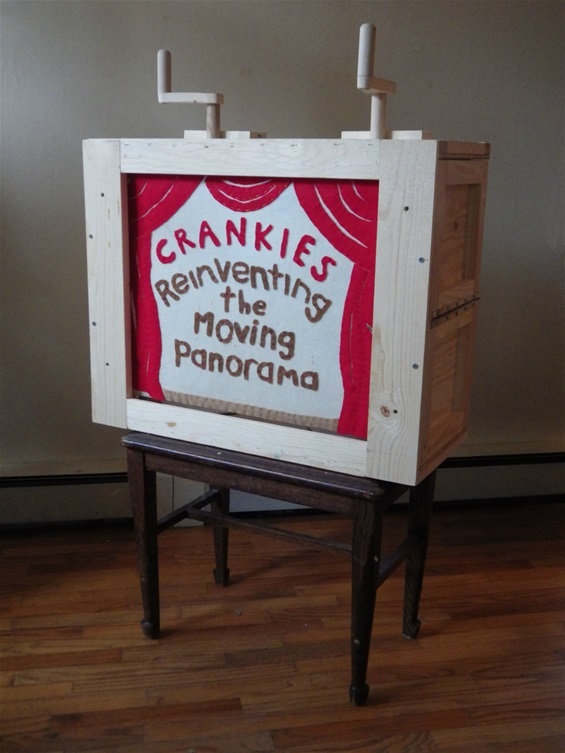 Finally, I gave my combination talk/crankie performance – Crankies: Reinventing the Moving Panorama as Contemporary Folk Art. (Thank you to Erkki Huhtamo for helping me with the title.) It was part Power Point presentation, part crankie performance with shadow puppetry and part “mini crankie fest “ as I was able to bring some miniature crankies to pass around. I talked about the revival of the art form and crankie artists who have been an inspiration to me: Elizabeth LaPrelle, Anna Roberts-Gevalt, Kathrine Fahey, Joanna Hruby and Dejah Leger. My husband made a box for me that folds up and could be put in the overhead bin on the plane. 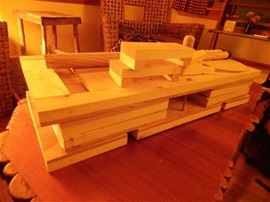 Here's a picture of it on the coffee table, ready to be put into a bag. Here is the box put together. Here is the box all set up and ready to go. Several people have asked to see the presentation. So sorry but it was not video taped. 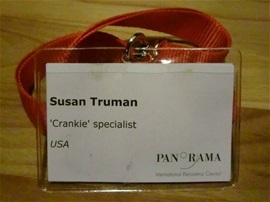 I love my "Crankie Specialist" name tag! 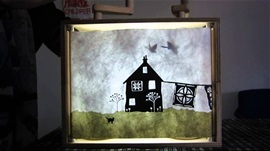 Finally, I want to thank independent researcher Suzanne Wray for encouraging me to attend the conference (I am so glad I did) and for helping me with the shadow puppetry on the fly! Many people sent well wishes to me on Facebook and through email – thank you! Photo taken by Erkki Huhtamo.